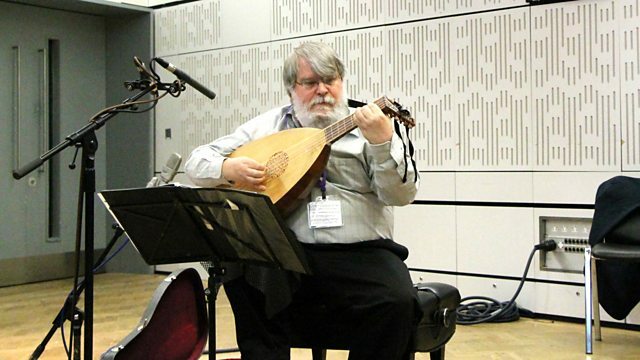 Sean Rafferty's guests include lutenist Paul O'Dette, who plays live, as does cellist Alban Gerhardt. Plus conductor Christian Lindberg. Sean Rafferty with a lively mix of chat, arts news and live performance. His guests include lutenist Paul O'Dette, who performs live before hotfooting it around the corner to Wigmore Hall, where he gives a solo recital. Cellist Alban Gerhardt also plays live for us ahead of an appearance with the Royal Philharmonic Orchestra at the Royal Festival Hall in London, and conductor Christian Lindberg talks to Sean down the line before a concert with the Royal Liverpool Philharmonic Orchestra. Music Arranger: Otto Zurmühle. Performer: Christian Lindberg. Orchestra: Tokyo Kosei Wind Orchestra. Conductor: Chikara Imamura. Windpower: Christian Lindberg/Kosei Wind Orchestra/Chikara Imamura. Singer: Teresa Wakim. Ensemble: Boston Early Music Festival Vocal & Chamber Ensembles. Conductor: Paul O’Dette. Conductor: Stephen Stubbs. Orchestra: Arctic Philharmonic Orchestra. Conductor: Christian Lindberg. Tchaikovsky: Symphonies Nos. 4, 5 & 6. Performer: Mark Bennett. Singer: Aksel Rykkvin. Ensemble: MiNensemblet. Director: Lazar Miletic. Singer: Samantha Hankey. Orchestra: Orchestra of the Age of Enlightenment. Gershwin - Rhapsody in Blue, Piano Concerto, Songbook.